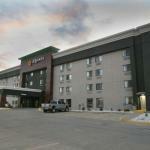 Up-to-date rooms flat-panel TVs free Wi-Fi and free breakfast are some of the reasons La Quinta Inn & Suites Des Moines West Clive is one of our guests' favorite hotels in the area. All 99 rooms in this four-story hotel are decorated in vibrant colors and boast have flat-panel TVs with 30 channels of HD programming and plug-in panels for your electronic devices. Thereâ? 's free Wi-Fi available in all rooms and hair dryers coffeemakers and ironing equipment come standard as well. Cost savings at La Quinta still buy you a heated indoor pool and hot tub so take advantage of it. Donâ? ?t skip your workout during your travel; instead make use of the hotelâ? 's fitness center. Mornings start with La Quintaâ? 's complimentary continental breakfast and a quick look at the newspaper â?? another freebie during the week. Parking is free and pets are permitted. A coin laundry is available for guest use. La Quinta is west of Des Moines off of I-35 and I-80 with plenty of restaurants nearby. It's eight miles from the Des Moines Convention Center the Civic Center and the Science Center of Iowa. Drake University is also eight miles from the hotel. Prairie Meadows Racetrack and Casino and Adventureland Amusement Park are 20 miles from La Quinta. Des Moines International Airport is 13 miles away.